When you walk down the art aisle at a store, you may feel overwhelmed. Art items that you might encounter are posterboard, illustration board, foam core and tag board. Each of the choices may look similar but serve different purposes. Posterboard, for example, is the most versatile and probably the most used. Posterboard is a type of flexible display board made out of cardboard that's often used to make posters and presentations. One side of standard posterboard is typically glossy, while the other side has a matte finish. 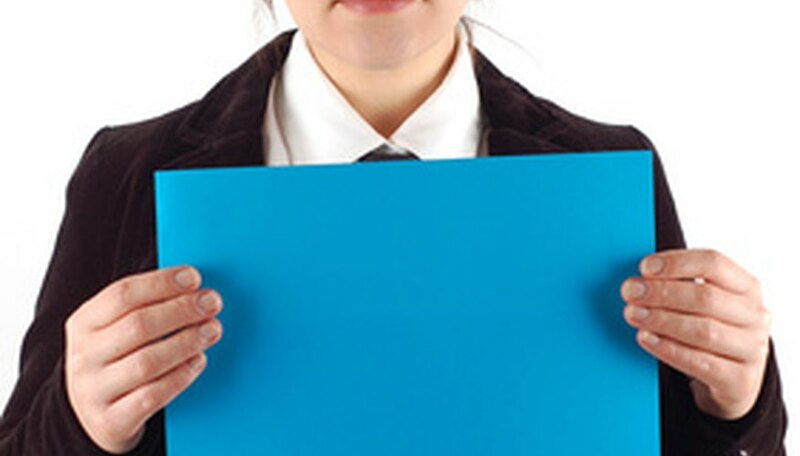 Posterboard usually comes in four-ply, which is thick enough for wet and dry media. White is standard when it comes to the color of posterboard. Most art supply stores also carry black posterboard. Posterboard also comes in neon or metallic colors like gold or silver. Some posterboards are one color on one side and a different color on the other. Standard posterboard is 28 by 44 inches. However, the board can be as small as 11 by 17 inches and as large as 24 by 36 inches. Some posterboard is printed with squares across it, similar to graph paper. The squares can only be seen up close and help with writing text in a straight line. The squares also help with arranging data on the board so that it is straight. Most posterboard comes are rectangular and can be displayed vertically or horizontally. Like other types of paper and cardboard products, posterboard is made through mechanical and chemical pulping processes. Mechanical pulping breaks down and separates wood fibers. Aluminum oxide and silicon carbide then further break down these fibers. In chemical pulping, chemicals are introduced to the wood at high temperatures creating cellulose bonds.